On many “hundred places to see before you die” lists, Niagara Falls often ranks high. 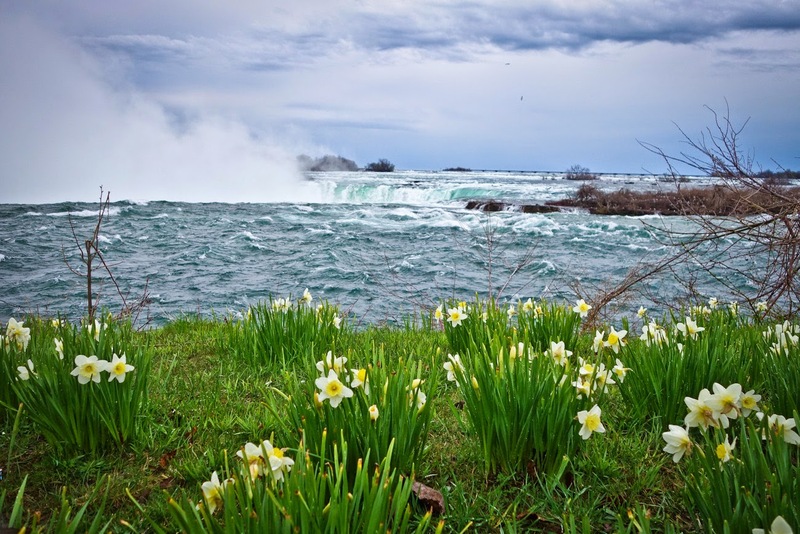 After the American Civil War in 1865, the New York Central railroad publicized Niagara Falls as the ideal honeymoon destination and it’s been a newlywed's mecca ever since. Even Napoleon Bonaparte's brother Jérôme visited with his bride in the early 19th century. Although my trip to the falls was for reasons not including the mentioned two, nothing prepared me for the sheer awesomeness of the falls and I could see why 22,500,000 people make their way to the falls a year. Niagara Falls is the collective name for three waterfalls that include the international border between Canada and the United States (more specifically the province of Ontario and the state of New York). These form the southern end of the Niagara Gorge. Because we were driving from Toronto to Boston, we visited the falls which exist on the Canadian side, the Horseshoe Falls (Bridal Veil Falls and the American falls on American territory and are separated by Goat Island). In my opinion the views of the falls from the Canadian side are more beautiful. If you are coming to see the falls from the American side (you can walk this) be prepared with your passport and official identification (the same goes for crossing from Canada to the United States). 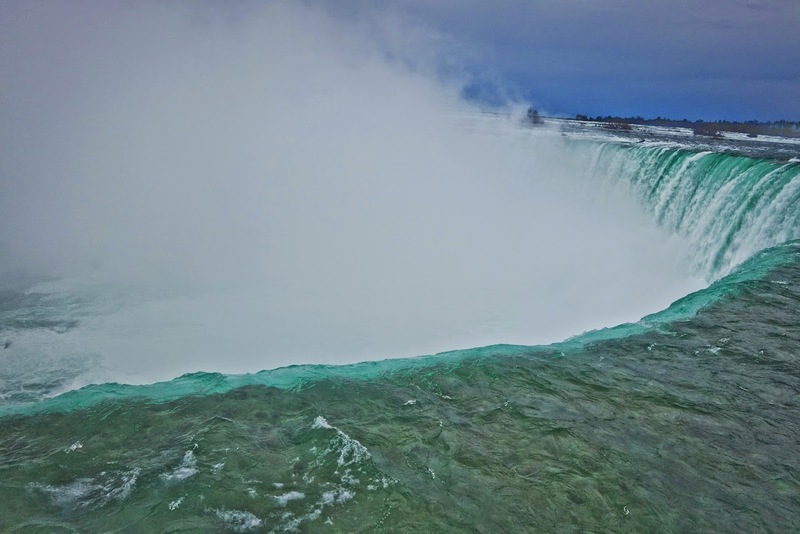 The Horseshoe Falls drop about 173 feet (53 m), while the height of the American Falls varies between 70–100 feet (21–30 m) because of the presence of giant boulders at its base. 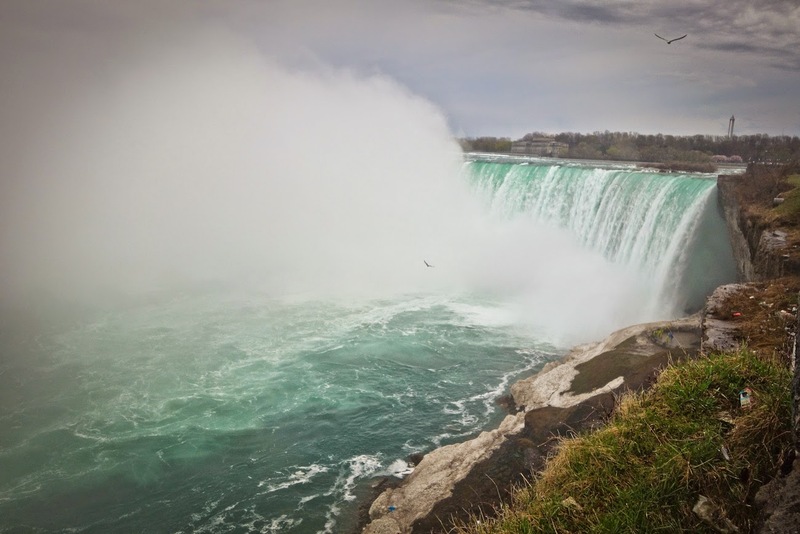 The larger Horseshoe Falls are about 2,600 feet (790 m) wide, while the American Falls are 1,060 feet (320 m) wide. The features that became Niagara Falls were created by the Wisconsin glaciation about 10,000 years ago. The same forces also created the North American Great lakes. In October 1829, Sam Patch, who called himself "the Yankee Leapster", jumped from a high tower into the gorge below the falls and survived; this began a long tradition of daredevils trying to go over the falls. After seeing the momentum of the water, I was happy to enjoy my views of the falls as far away from the cliffs edge as possible. Whoa, its a long way down! Although not all who went over the falls had the intention of gaining notoriety or fame. 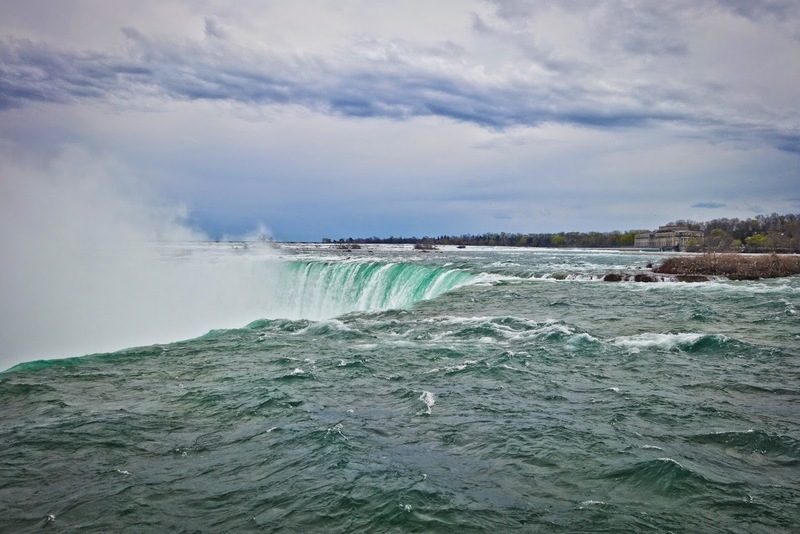 In 1960, Roger Woodward, a seven-year-old American boy, was swept over the Horseshoe Falls protected only by a life vest. 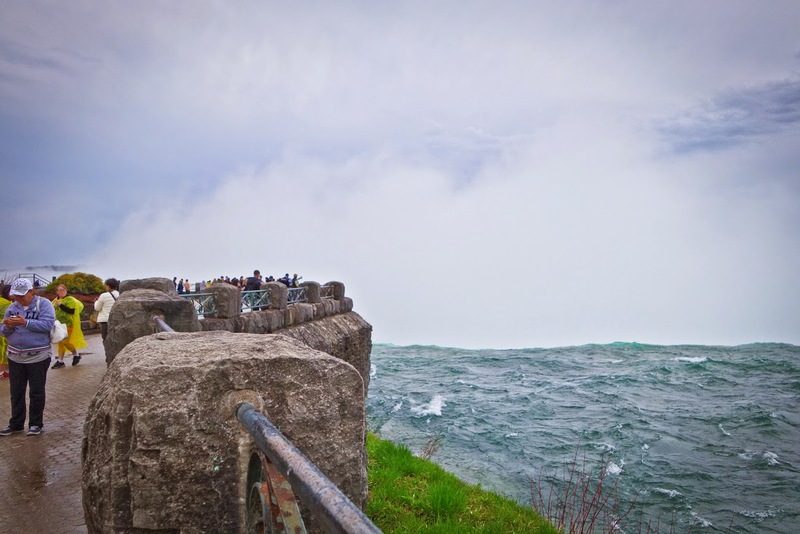 As two tourists pulled his 17-year-old sister Deanne from the river only 20 feet (6 m) from the lip of the Horseshoe Falls at Goat Island, Woodward was plucked from the roiling plunge pool beneath the Horseshoe Falls after grabbing a life ring thrown to him by the crew of the Maid of the Mist boat. This near disaster was coined the "Miracle at Niagara". Get ready to feel the spraaaaay! When you visit the falls be prepared to get a bit wet as the force of the water falls is so strong, one is guaranteed to get sprayed. You will see many tourists wearing rain gear fully prepared for the elements. Something that surprised me when I arrived to the falls was the little city of tall buildings created solely for entertainment and tourists. When you visit Niagara Falls Canada you will also find, restaurants, hotels, and attractions. There are even casinos, a shopping outlet, concerts offered, fine dining, golf courses and spas. 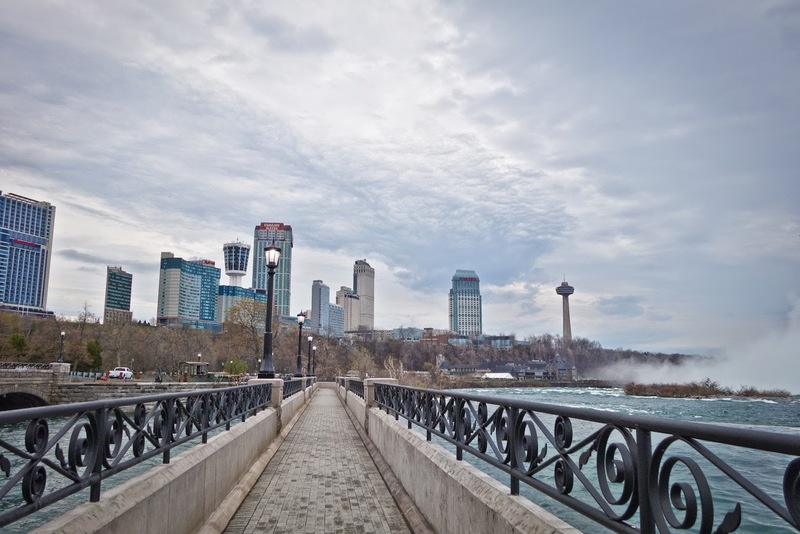 There a is a theme park (Skylon Tower), and water parks inside the hotels, a climate controlled Ferris wheel and kid-friendly restaurants (Clifton Hill). If you are there solely to see the falls, there are several places you can park. Because we were there around 7:00 pm during off season, we found a parking lot across from the falls with no fee. Normally parking is between $5-$20 CAD. Next to the several parking lots across from the Canadian falls is a beautiful park filled with different species of flowers. Also inside the Niagara Park is a botanical garden and butterfly conservatory. 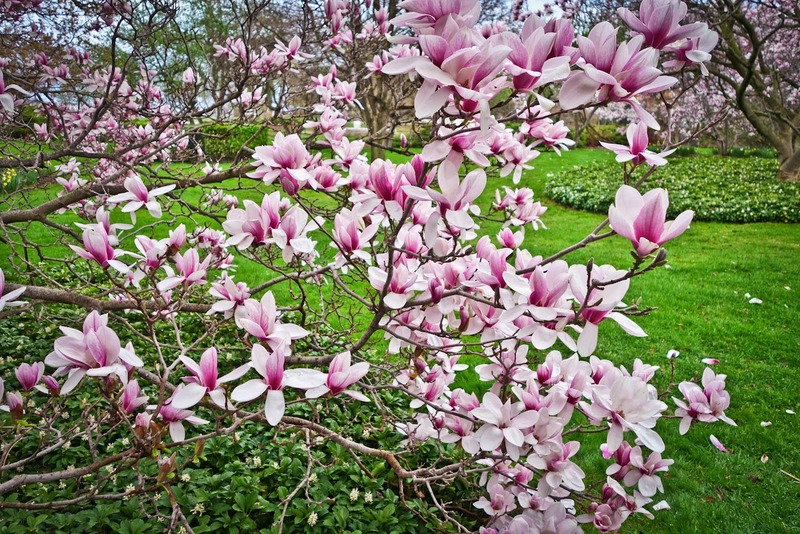 Beautiful Magnolia, Saucer tree in Niagara Park. 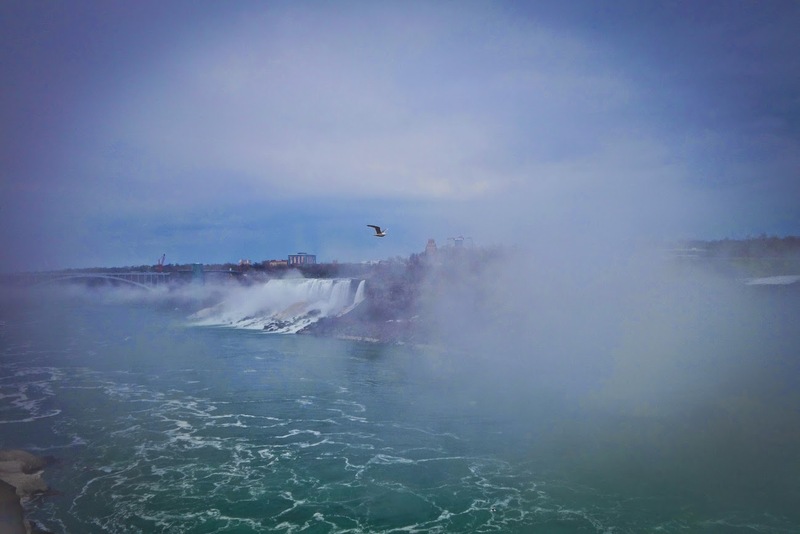 Managing the balance between recreational and commercial (and we must not forget the beauty of the falls), Niagara is definitely a spectacle to experience once in your life. You don’t have to fall off the cliff and survive to behold the wondrous “miracle at Niagara”.